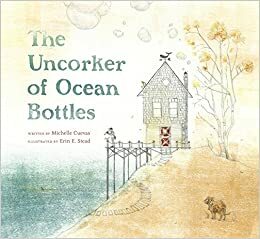 Summary: The Uncorker of Ocean Bottles has an important, if lonely, job. He removes the corks from bottles found in the ocean and delivers the messages to the addressees. Although he loves his work, the Uncorker wishes he could find a message addressed to him. Since he doesn’t even have a name, this seems unlikely. But one day he finds a message with no name on it; it’s an invitation to a party to be held at the beach the next evening. The Uncorker goes to work, asking around to see if it belongs to anyone. No one knows about it, but everyone thinks a party seems like a good idea. That night, the Uncorker goes to the beach to apologize to the sender for not delivering the message. When he gets there, he discovers a gathering of all the people he asked about the party. He has such a good time that night that he leaves planning to deliver the same message again the next day. 40 pages; ages 4-8. Pros: Beautiful language and voice used to tell a captivating story of new friendship. The illustrations by Caldecott Medalist Erin E. Stead perfectly capture the dreamy, seaside quality of the text. Cons: How did the Uncorker wind up with no name? At first I didn’t care for this book, but by the end of the book, I liked it.